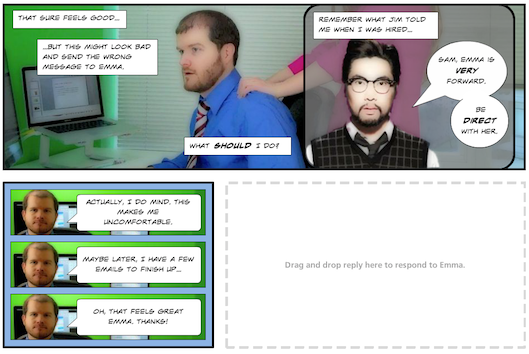 Next up in our series on Articulate Storyline guru contest winners: our second-runner-up, the scintillating “Broken Co-Worker,” by eLearnerEngaged. You can view the other runner-up course here. Under the direction of Ryan Martin and Anna Sabramowicz, eLearnerEngaged cleverly emulates the challenges of managing appropriate workplace boundaries in this humorous yet highly effective assertiveness training course. You start the course with a little backstory on Sam, the main character. He and his fianceé have just relocated for his dream job—but his co-worker Emma is anything but dreamy. Her brash interpersonal behavior has pushed Sam to the brink of quitting. It’s your job to help Sam set better boundaries throughout the day as he interacts with her. At the end of the course, your decisions determine whether Sam keeps his job or throws in the towel. Throughout the course, it’s clear that eLearnerEngaged was keen to keep learners engaged. Ryan notes, “We know from experience that most people never complete an e-learning course, usually because it’s too text heavy or they get bored.” In lieu of a traditional teach-then-quiz model, where answers are reviewed after each section, Ryan and Anna use a fluid approach, where your decisions, as Sam, drive the plot. Each exasperating scenario with Emma stops when it’s time for Sam to react to her. Hover over the response options to activate images of Sam, confused and pensive, pleading for your help. Anna explains, “We wanted to make it nuanced and contextual, like life, where there isn’t always a clear answer.” Once you drag-and-drop Sam’s response, a branched video clip plays an appropriate situational reaction from Emma, and transitions into the next scenario. Behind the scenes, a scoring system calculates points for each of Sam’s answers. Storyline’s triggers and variables link accumulated points to four customized outcome scenarios. A final screen summarizes Sam’s stay-or-go decision, including a recap of each scenario. Hover over each one to see whether the response you chose was appropriately assertive or missed the mark. Overall, “Broken Co-Worker” amuses us from start to finish, without downplaying the serious message about cultivating positive relationships in the workplace. Nice job, eLearnerEngaged! 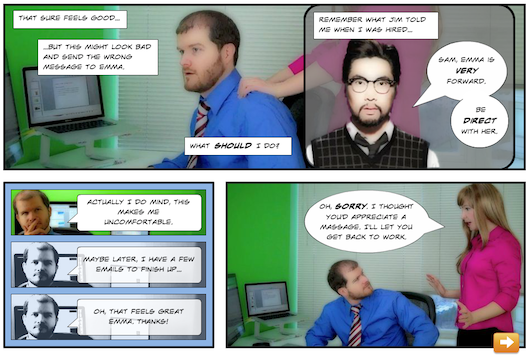 “Broken Co-Worker” wasn’t the only eLearnerEngaged guru entry that caught our fancy. Anna and Ryan’s “DC Fundamentals” course on electrical principles earned an honorable mention. We just love this dynamic duo! “DC Fundamentals” connects the science of electricity with the real-life problems electrical apprentices can face in the field. 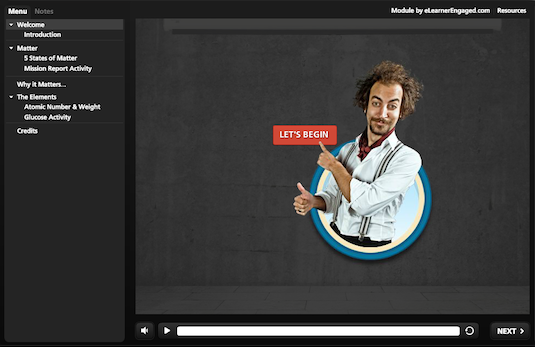 Ryan recalls, “Our goal was to make the material less boring than learners would expect. To do that, we used lighthearted narration, reduced the amount of on-screen reading, and made each screen in the progression have its own unique look and feel.” Drag-and-drop and click-and-reveal activities keep the user active exploring course material. He continues, “We mixed assessment and application all the way through the course. 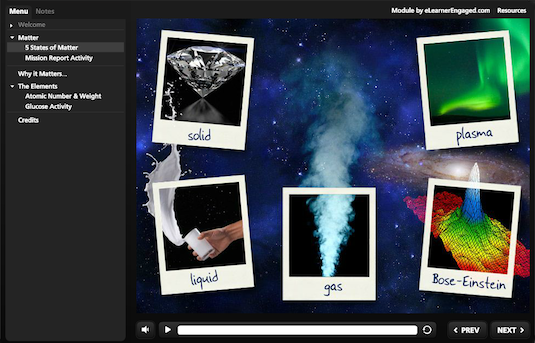 With Storyline, it’s easy to make such a learning experience seamless.” The course dives right in with a tour of the states of matter. Triggers reveal five different slide layers that step through the basics, then a brief drag-and-drop assessment makes sure you’ve got it covered before moving on to atomic elements and periodic table fundamentals. A final click-and-reveal assessment tests your hand at building a molecule, using states and layers to give feedback about your formula. Anna admits, “I love the glucose molecule activity. 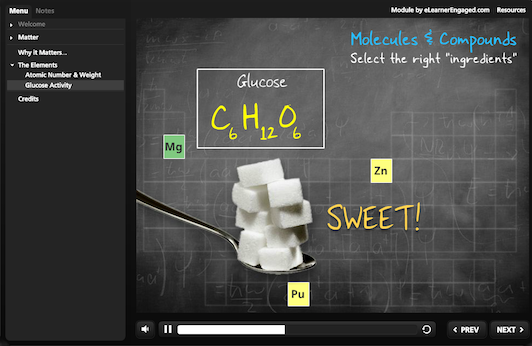 The feedback on incorrectly selected atoms and the resulting spoonful of sugar make me smile.” We have to hand it to Anna and Ryan of eLearnerEngaged—your witty visuals and well-designed courses make us smile, too. We really do love you Articulate for putting this together for us and having our demo featured here. I’ve also learned that regardless of the lipstick and wig you wear, your face (and the crazy expressions you make when “acting”) will always give you away. Wow, glad I chose to be an instructional designer.